Sequencing of values is a common operation required to perform in many of the common use cases like finding first x values, last n values etc. There are numerous ways of implementing the sequencing logic. Since the 2005 days, one of the most popular and easier methods was to use a subquery based on APPLY operator to get associated values in sequence. Though LAST_VALUE and FIRST_VALUE are quite handy on many occasions, one of the main limitations for the functions have been the absence of IGNORE_NULLS support, as found in many other RDBMS. This makes it hard to use the functions in cases where intermixed NULL values are present as it doesn't handle NULLs gracefully. The illustration given below is taken from a real project scenario with some sample dummy data replacing the actual ones. The scenario on hand consists of operational data for a series of machines whose opening and closing reading needs to be captured for each execution cycle. The catch here is that machines may or may not give reading at the prescribed times based on the availability of input. The readings will not be in any kind of sequence. The requirement was to get the opening (first) and closing (last) reading for each operational cycle for each of the machines. This scenario can be simplified using a sample data as below. On careful analysis of the above result, we can find that both first and last readings are returned as NULL values for every machine. This is because of the presence of NULL values towards beginning and end for each machine's execution cycle. But these are valid business scenarios as they represent instances within execution cycle of the machines where there was no visible output for reading. Since FIRST_VALUE, LAST_VALUE functions cannot be applied for getting the solution for the scenario on hand, an alternate approach has to be followed for getting the required solution for the use case on hand. The use case requires identifying the first non NULL value and last non NULL value within each group determined by the PARTITION BY clause for getting the first and last reading. Now the query will return the expected results i.e initial and final reading along with each row. clause to get the sliding window with respect to each row. The cases where it returns 1 indicates that's it's the first or the last non NULL value in the group. Hence putting a filter of 1 for the count retrieves the first and last reading. Functions LAST_VALUE and FIRST_VALUE can't be used to get last and first values within a group when data has intermixed NULL values. 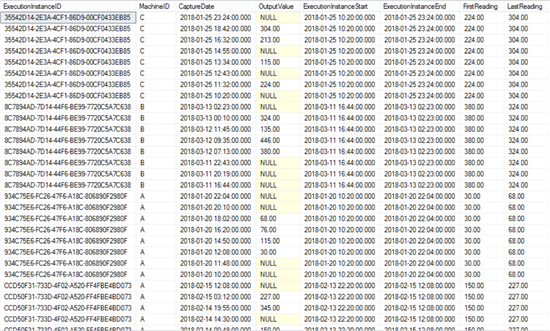 The implementation of FIRST_VALUE and LAST_VALUE does not support IGNORE NULLs mode in SQLServer.